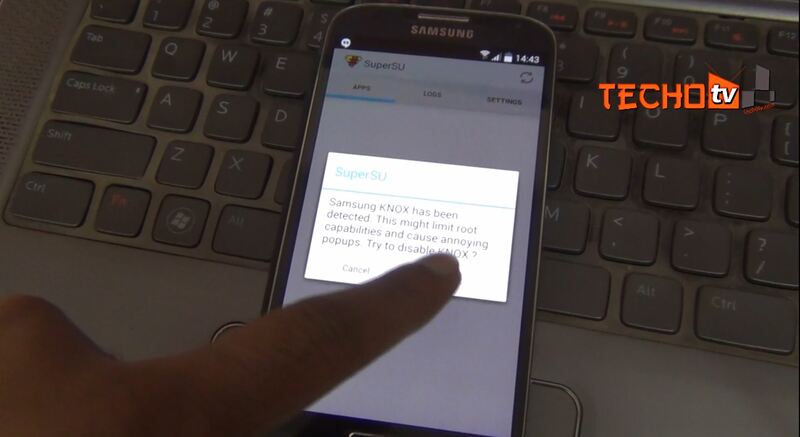 [sch i=”description” c=”In this video tutorial, we’ve shown you how to root the latest android 4.4.2 kitkat firmware on Samsung Galaxy S4 GT-I9500 exynos octa model. This is CF Auto-Root method and it works for firmware versions of all countries. With this method, you’ll get root access on your phone but not custom recovery. This method is just for rooting”]. Download CF Auto-Root package for GS4-I9500 from here. Extract it. Connect to pc. Launch ODIN. Click on PDA button and navigate to the extracted root file. Disconnect phone if PASS message is displayed in ODIN. The phone will be automatically rebooted into normal mode after few seconds. You’ll see new SuperSu app installed. Launch it on your phone. You may be prompted to disable knox. Tap ok. Done. Check out this link for installing cwm/twrp recovery on GS4 I9500.